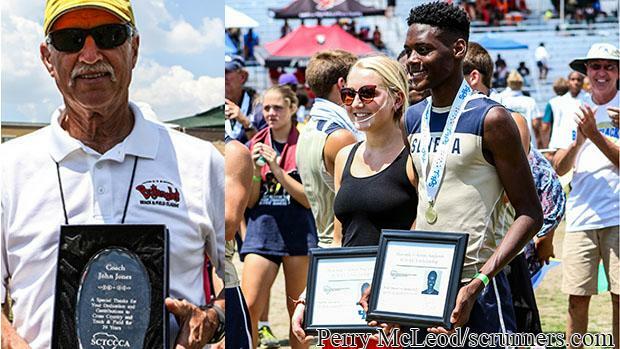 The South Carolina Track and Cross Country Coaches Association announced track and field end of the season awards and Sharonda -Coleman Singleton scholarship recipients today. Heather DeLorenzo (James Island) and Elijah Stewart (Seneca) are the 2018 recipients of the Sharonda Coleman-Singleton Scholarships. The one time scholarships are $600. Retiring Spring Valley coach John Jones received the first-ever SCTCCCA Jim Kilbreth Service Award for his support of the association and setup of the SCHSL Championships in both sports for 39 years. Jones, also served several positions on the association board. Coaches of the Year by classification and gender were also announced in the press release. To receive the honor, coaches must be a member of the SCACA and SCTCCCA and finish in the top three in team competition of the state meet. The winners of coach of the year for girls: Kevin Shiver (5A, Wando), Warren Eure (4A, Ridge View), Bill Peterman (3A, Waccamaw), Darrell Durham (2A, Christ Church), and Kevin Miller (A, Scott's Branch). Boys: Shiver, Alvin Harvey (4A, Beaufort), Chris White (3A, Seneca), George Carr (2A, St. Joseph's), and Wayne Farmer (A, Scott's Branch). Officials of the year: Jim Kilbreth and David Hickman. Stay tuned for continued coverage from the SCHSL Championships and coming Wednesday night final details about SCRUNNERS Meet of Champions in memory of Bob Jenkins to benefit Worthy Boys and Girls Camp of Rock Hill.